The title of Anna Frlan’s and Gail Bourgeois’ exhibition, Stories Nearby, suggests something personal, a tonally quiet counterpoint to sensational headlines and explicitly brutal media images. Both artists have spent many years considering the after shocks of war, and how anxieties, stemming from horrific or threatening events that have been experienced by civilians or military personnel, are passed on to succeeding generations. Although the human form is never literally portrayed by Frlan or Bourgeois, it is intensely felt through references to objects made or altered by humans. Whether it is Frlan’s War Chest, with its lace-like deadly contents, or Bourgeois’ drawing, The heart’s long offensive reach, with a lethal rod, like a blood line, suspending two rectangular concave shapes, the emotional effect is powerful. There is the same tragic sense found in Betty Goodwin’s work. The Montreal artist (1923-2008) dealt with the human body, often through the memory of the human body in the objects and clothes used, explaining, “It’s all concerning humanity.” Like Goodwin, Frlan and Bourgeois are doing work that concerns humanity. They provoke a desire to consider truths that are often obscured by less nuanced forms. Nancy Baele taught English and art and was a librarian in Ottawa Elementary Schools. After her teaching career, she became the Visual Arts writer for the Ottawa Citizen. Now retired, she enjoys being in the company of family, friends and strangers, gardening, reading, attending music and dance performances, looking at art and writing short stories. Gail Bourgeois maintains a drawing-based studio practice where her drawing series lead to ways of investigating other materials and means. In 2016, she presented a solo exhibition in the Firestone Gallery of the Ottawa Art Gallery. In 2013-2014, she was the inaugural artist-in-residence at the Diefenbunker, Canada's Cold War Museum. 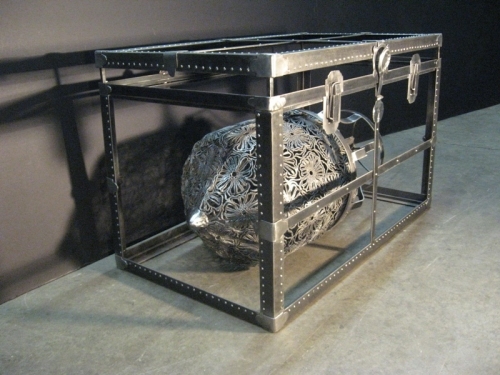 Sculptor Anna Frlan, the daughter of Croatian émigrés, works exclusively with steel. Recent solo exhibitions are Kitchen Anatomy, Interbellum, and The Age of Atomic Anxiety at the Diefenbunker Museum. Frlan has received grants from the Canada Council for the Arts, the Ontario Arts Council, and the City of Ottawa. Vernissage: Thursday, November 3, 5:30 to 7:30 p.m.
SOUVENIRS is an exhibition which highlights 43 new acquisitions to the City of Ottawa Art Collection. Artworks are added to the collection each year by way of a peer assessment process through purchase, donation and/or commission. In 2016, 28 artworks by 28 artists were purchased, 9 artworks were donated and 6 site-specific public art commissions were completed. Artworks that become part of the City of Ottawa Art Collection are placed in public spaces and municipal buildings to be viewed and enjoyed by residents and visitors. The City of Ottawa and its various municipal predecessors have been collecting artwork by professional artists for over 30 years. As a result, the Collection has grown to include more than 2600 artworks by more than 700 artists. The works presented in this exhibition are but a small fragment of a much larger visual arts community which comprises a magnitude of artistic talent in the region. Many of the artworks in this exhibition embody themes of loss, memory and recollection. Some works express the range of emotions associated with grief while others explore the enigmatic qualities of memories and past events. SOUVENIRS offers tangible resonance, quiet reflections and vivid keepsakes inspired by what is formed and remains in our consciousness and by what can be created as tribute through dedicated insight. Vernissage: Thursday, September 15, 5:30 to 7:30 p.m.
Award ceremony begins at 6 p.m.
Exhibition tour with the artist: Sunday, September 25 at 2 p.m.
Untitled, 2016, digital print, 32 x 43 cm. Courtesy of the artist. The Karsh Award honours the artistic legacy of celebrated Ottawa photographers Yousuf and Malak Karsh. It is presented every two years to an established local artist for outstanding work in a photo-based medium. Schreier's images of rooms have much in common with the portraits. ln Camera Obscura, we see the comer of a room with a shadowy presence, or a bare wall with a sharply defined line running from one side to another, or the precise edge of a museum display case. Or we see people occupying museum rooms in which the space that separates is alive with meaning. He sees these spaces with a remarkable grace and beauty and a sense of pictorial structure that is impeccable. Their minimalism invites the imagination. They are spaces into which we withdraw into ourselves, and with our eyes we listen to a sound that is pure and haunting and, at the same time, serene. Above all, however, they reflect the state of mind of the artist who is seeking to define his own space and his relationship to the world. Schreier's photographs are concerned with both exterior space and interior space. And both states illuminate what it is to be human, expressed with the visual poetry that exploits the elements of line, form, colour and light. Michael Schreier is a professional artist and photographer who has dedicated his considerable professional career to the celebration of both the public and private hero. Recent work includes Storyteller/Waiting for Words at the Ottawa Art Gallery, curated by Emily Falvey, 2009, and his curating of the exhibition Dave Heath, A Heritage of Meaning, 2013 at the Ottawa Art Gallery. Selected works are represented in both public and private collections, including the National Gallery of Canada, the Canadian Museum of Contemporary Photography, the National Archives Photography Collection, the Agnes Etherington Art Centre, the Canadian Portrait Gallery, Visual Studies Workshop (Rochester, New York), Light Work (Syracuse, New York), Carleton University Art Gallery and the University of Ottawa Library Special Collections. Vernissage: Thursday, August 25, 5:30 to 7:30 p.m.
As a supplement to our regular programming, Karsh-Masson Gallery is pleased to partner with the University of Ottawa’s Department of Visual Arts to provide a valuable mentorship and professional development opportunity. Based on lived experience, Elle Chae’s most recent work questions the notion of home. Chae explores how the occupants’ interactions can blur the notion of home as a shelter. Influenced by Susan Sontag’s Regarding the Pain of Others and Gaston Bachelard’s The Poetics of Space, this body of work considers painting’s expressive nature as a tool to invent and re-invent apprehension-filled narratives within the domestic environment. Interested in the notions of the sublime and affect, Chae explores the genetics of materials expressing and embodying different degrees of physicality and intensity, the scalable impact of colours and tones on viewers’ sensory systems, and the wide range of techniques accentuating the material presence of oil paint. The result is a psychological space that highlights painting as a space of contemplation where meaning is formed based on interpretation, synthesized experience, context and inventiveness on the part of the viewer and the artist. Heidi Conrod’s recent paintings reflect on the nature of memory and time and the fluid ways in which these two immaterial phenomena interact. Each painting is put through a tangible and intangible process of creating, disrupting and reforming. Conrod’s methodology extends the compositions and builds a sense of time into the work. The past, or the idea of remembered time, becomes substance within the layers of paint, engaging yet distancing the viewer from the original subject matter. Infused with ambiguity, the works operate in the areas between inverse concepts: history and imagination, abstraction and representation, past and present, the intimate and the social, and the psychological and the corporeal. Conrod uses photographs sourced from the Internet as a starting point. Imagery is chosen based on connections to her own personal experience yet she intends to capture a larger human experience by addressing the ephemeral nature of time, nostalgia, loss, passion, longing and obsession. Elle Chae is a Korean-born Ottawa-based artist who lived in South Korea and Fiji before moving to Ottawa. She obtained her BFA from the University of Ottawa in 2011. Chae’s work has been exhibited in Ottawa, Eastern Ontario and Montréal, and she is currently an MFA candidate at the University of Ottawa. Heidi Conrod is an Ottawa-based artist. She obtained her BSc (Biology) and BFA from the University of Ottawa. Conrod’s work has been exhibited in Ottawa, Gatineau, Toronto, Calgary, Halifax and Vancouver. She is currently an MFA candidate at the University of Ottawa. Vernissage: Thursday, June 16, 5:30 to 7:30 p.m.
Exhibition tour with the artist: Sunday, June 26, 2 p.m.
Kaarsemaker explores the alienating aspects of public space, urban redevelopment, and museum discourse, a mise en abyme of representation within representation... The spaces, now tipped up, take on a theatrical quality, though, again, the living agents of social discourse are missing. Instead we may see the vacant rooms and empty chairs of a conference on contemporary art. The paintings leave us unsure as to whether we are inside this world or out, like the animals in glass cases isolated from the reflections of nature found on the ubiquitous glass panels of public buildings. These are displays which resist display, which obscure and make manifest layers of construction and mediation, reflecting back to us both the outside physical world and the inner world the viewers or audiences bring with them. David Kaarsemaker’s paintings examine representation and its mediation through reproduction and language. Based on maquettes of imaginary exhibitions, he examines the layout and lighting of sites of display as a way of questioning the metaphorical foundations of conceptual structures in visual language. Born in Chicago and currently living in Gatineau, Kaarsemaker holds an MFA from the University of Ottawa (2014) and a BFA from Concordia University (2004). He has exhibited at the Carleton University Art Gallery, Art Mûr, Galerie St-Laurent + Hill, Christina Parker Gallery and Karsh-Masson Gallery. His work is held in the collections of the Newfoundland Provincial Art Bank, The Rooms Provincial Art Gallery, the City of St. John’s and the City of Ottawa. He teaches painting and drawing at Algonquin College in Ottawa and is represented by Galerie St-Laurent + Hill (Ottawa) and Christina Parker Gallery (St John’s). Vernissage: Thursday, May 5, 5:30 to 7:30 p.m. Artist talk (in English with bilingual Q & A): Sunday, May 22, 2 p.m. This work is about legacy, about a heritage that has been passed down through the female lineage. We recognize an outdated domesticity only recently abandoned – but is it really a thing of the past? The artist salvages objects that have withstood years of wear, that have imparted their soul to a household, mementos that create warmth of spirit, that give the impression of forming a coating. She persists in keeping a record to express an unsettling view of the past. The rest, the materials act as traces, as clues. Without clearly revealing it, they return us into the past. Traces of childhood, of an imaginary world that has been imprinted, somewhere, in someone. Traces of an era not that far away, when women diligently accumulated rags, valiantly prepared what was needed to provide comfort from the cold. Traces of oil, grease, humus, dried mud. From that point on, the work becomes inseparable from conservation, but also from celebrating others ─ mother, father, brothers, great aunts, grandmothers ─ and a common ground. Aislinn Leggett grew up on a small farm in Namur, Quebec. Her family history is deeply rooted in the area, where the origins of her ancestors can be traced through a line of farmers, wilderness guides and forestry workers. Leggett works with photography, installation and video to delve into the notions of memory and archives. Leggett has exhibited in Canada, the United States, Europe and Asia, including the Noorderlicht Photofestival in the Netherlands and the Rencontres Internationales de la Photographie en Gaspésie. In 2014 she published a book with Les Éditions du Renard and recently exhibited two installations at Maison de la Culture Mercier in Montreal, where she currently lives and works. Vernissage: Thursday, March 17, 5:30 to 7:30 p.m. Artist talk with Adrian Göllner (in English) and Annie Thibault (in French): Friday, April 1st at 12:30 p.m. The phrase ‘full catastrophe’ derives from the 1964 film Zorba the Greek, whose central character exclaims: “Wife, children, house, everything. The full catastrophe.” Rather than inferring a catastrophic event however, in which the present is overwhelmingly engulfed, it is intended to denote a vastness of human experience. In this exhibition then, the concept of the ‘full catastrophe’ evolves from an expansive, panoramic perspective that embraces the totality of life while becoming crowded with its rich and immense detail. Full Catastrophe showcases recent works by Elle Chae, Heidi Conrod, Adrian Göllner, Gillian King, Anthony Sauvé, Justine Skahan and Annie Thibault. Elle Chae is a Korean-born Ottawa-based artist. She lived in South Korea and Fiji before moving to Ottawa. She obtained her BFA from the University of Ottawa in 2011, and is currently an MFA candidate at the University of Ottawa. Chae’s paintings have been exhibited in Ontario and Quebec, and she is represented by Wall Space Gallery in Ottawa. Heidi Conrod is an MFA candidate at the University of Ottawa. She received her BFA in 2012 and her Bachelor of Science (Biology) in 1994. She completed her Diploma at the Ottawa School of Art, concentrating on drawing and printmaking. Her work has been exhibited in galleries across Canada. Conrod’s recent abstract paintings explore ideas of flow of perception and the act of memory. Adrian Göllner received his BFA from Queen’s University in 1987. An Ottawa-based artist, Göllner continues to mount exhibitions at home and abroad and has had the good fortune to have received 20 public art commissions. Göllner has held numerous board positions with Artist-Run Centres and arts advocacy groups and is currently undertaking his MFA at the University of Ottawa. Gillian King is an Ottawa-based painter and multidisciplinary artist, curator, and art educator from Winnipeg, Manitoba. King is a current MFA Candidate at the University of Ottawa (2016) and holds a BFA Honours in Painting from the University of Manitoba (2011). King’s work explores control and chaos when working with materials that cross thresholds between painting and sculpture. Her work explores concepts of the Anthropocene or human and non human interactions. She has shown in various galleries in Ontario, Manitoba, Alberta, Quebec and the Netherlands and has recently completed residencies at The Banff Centre (Banff, AB) and Spark Box Studios (Picton, ON). Anthony Sauvé is a multidisciplinary artist with a background in photography and originally from Montreal where he obtained a BFA in Print Media from Concordia University. His work is performance-based: video-installations in which he personifies characters and enacts nonsensical comical situations. He is currently an MFA candidate at the University of Ottawa. Justine Skahan obtained her BFA in Studio Arts from Concordia University in 2010 and is currently an MFA candidate at the University of Ottawa. She has completed residencies at the Banff Centre as well as the Wild Bush Residency in Val-David. In 2015, Skahan traveled to Venice, Italy during the Biennale as the recipient of the inaugural Stonecroft Foundation Venice Scholarship. She most recently participated in the exhibition Shelter at Lonsdale Gallery in Toronto. Annie Thibault lives and works in Gatineau, Québec. Inspired by an aesthetic of life in which multiple interactions take place between art, science, and nature, she incorporates drawing, installations and video into her artistic practice. Noteworthy are her participation in the Intrus/Intruders exhibition at the Musée national des beaux-arts du Québec (2008) and in Dé-con-structions at the National Gallery of Canada (2007). She has created many permanent public artworks, including Élora at the Oncology Pavilion of the Hôpital de Gatineau (2009). Her works are featured in the collections of the Musée national des beaux-arts du Québec, the City of Ottawa, Ottawa Art Gallery and Loto Québec. She is currently pursuing her MFA at the University of Ottawa. Vernissage: Thursday, January 28, 5:30 to 7:30 p.m.
Exhibition tour with the artist: Sunday, February 7 at 2 p.m. Traditions exist in a state of constant flux. They endure because they are repeated – passed on from one generation to the next – and yet with each unique repetition they also necessarily change and transform. In the Anishinaabeg worldview, transformation signifies power. We see this concept reflected in our stories of manitous and spirit beings who possess the ability to shapeshift and metamorphose. Much like these powerful entities, the Anishinaabeg have also maintained this profound capacity for change and adaption. As memories recall and drum up traditions of the past, the ongoing rhythm of cultural continuity manifests memory newly in the present. In the solo exhibition Mnemonic (Re)Manifestations the latest works by artist Barry Ace illuminate the confluence and permeability of the historical and the contemporary, and further explore the continual stir of memory and tradition. Michael Witgen, An Infinity of Nations: How the Native World Shaped Early North America, (Philadelphia: University of Pennsylvania Press), 2012. Barry Ace is a practicing visual artist and the recipient of the K.M. Hunter Visual Artist Award for 2015. Drawing inspiration from multiple facets of traditional Anishinaabeg culture, he creates objects and imagery that utilize many traditional forms and motifs. He then disrupts the reading of these works with the introduction of other elements, endeavouring to create a convergence of the historical and the contemporary. His work can be found in numerous public and private collections in Canada and abroad. 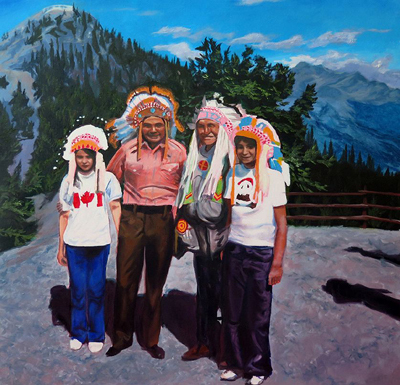 He is a band member of M’Chigeeng First Nation, Manitoulin Island (Ontario) and is represented by Kinsman Robinson Galleries in Yorkville (Toronto).